In South Orange Country CA., the teachers of the Capistrano Unified School District had just finished day three of a district wide strike. Then, late last night at 11:40, it was announced that the strike was over, the two sides had reached a tentative agreement. This is a district of 36 elementary schools, 2 K-8 schools, 10 middle schools, and 6 high schools. Roughly 52,000 students living in Aliso Viejo, Dana Point, Laguna Niguel, Mission Viejo, Rancho Santa Margarita, San Clemente and San Juan Capistrano CA. This has been covered by the SoCal LA news stations, LA Times, and of course, OC Register. This district is noted for being rather conservative. I would say the greater majority of teachers call themselves republican or independent. Nearly 90% of those teachers walked the picket lines Thursday, Friday and Monday to support of their CUEA teacher’s union. Thats right. 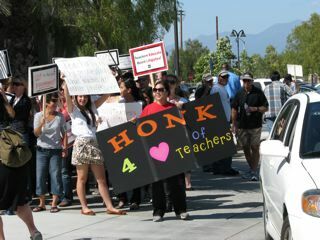 I said union, Republicans in a teacher’s union, marching on picket lines in Orange County California. 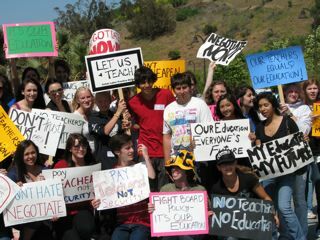 Many parents and students joined them on the line and at numerous rallies. So what was the big problem? Is it all about the budget having a 34 million dollar shortfall? To help with the budget shortfall, the teacher’s CUEA Union had put forth good faith in agreeing to a 10.1% TEMPORARY pay cut. It became obvious something else was on the agenda. Simply put, the Board of Trustees wanted to make it a PERMANENT 10.1% pay cut. That is the equivalent to asking a teacher to work one month out of the year for free. Nearly 2 and a half MILLION for private Attorney fees for the Board of Trustees. Security Firms $100,000.00 for uniformed guards at all the schools and at the districts office. $275.00 a day to subs (scabs) that cross the picket line to replace the Teachers normal rate of $90.00 a day. Phone banks at the district to handle the flurry of all the calls. Numerous Robo Calls giving parents daily status for each of the schools. That can’t be free. Since when does a public school system need a private PR Firm? How much is that phone bank going to cost the district? If it is only about the budget shortfall, then why all this spending? The students and families have an overwhelming support for the teachers and wanted to see them treated fairly. With Star Testing coming up and AP testing next week, the pressure was on. Add to that, reports that the UPS drivers would not cross the picket lines to deliver the AP Test materials. How can something like this happen to a district with award winning schools? Cue the Education Alliance of Orange County. The Education Alliance was formed in 1994, and operated as a political action committee supporting candidates who support local control of our schools, the rights of parents to make educational choice for their children, and an emphasis on basic, academic instruction. Support for these common sense principles put the Education Alliance squarely at odds with the teachers unions. The Education Alliance enjoyed a substantial measure of success both in electing school board candidates during the three election cycles in which it functioned. Ken Williams, Kay Weymouth, Tammie Bullard, Frank Ury, Jim Righeimer, Phil Yarbrough, Matt Harper and Alexandria Coronado are just a few of the many current local political leaders who the Education Alliance supported. Since the 1990’s the performance of our schools has continually declined. Today it is still far below its potential, and the control of our education system by the elite, liberal bosses who run the teachers unions have been consolidated and are now more complete than ever. Even the most modest changes, such as merit pay and charter schools, are strenuously opposed using the funds of teachers who often support these proposals. This was shown in the 2005 special election in which overwhelming union spending was used to defeat Governor Schwarzenegger attempts at reform. The Education Alliance began to become the organization committed solely to giving a voice to parents and teachers who support excellence for our children through means other than the liberal, self-serving policies of the teachers union leadership and their allies in the education establishment. The web site is rather creepy with it’s last update from 2007 and a “paper crunching” sound. It’s like a ghost town. If the ideas of the Education Alliance are so good, why hide them? Thank goodness for bloggers. Especially this one, Ellinorianne. She did an incredible job shinning a very bright light on this issue before our school district both in local blogs and at the Daily Kos. This video the Ellinoianne posted in the blog both informs and entertains. The Board of Trustees are now in power because of a recall election. It’s complicated as are so many things surrounding this issue. I would be all for talking about innovation in education and might really enjoy hearing a debate about how a charter or voucher system could benefit this school district but this EA group has lost me. The minute they mention reform, I know that means cutting teachers pay and pushing to privatize our public education system. Now we have a new recall effort that I support. Students have become very involved. There will be a huge new crop of 18 year old voters in our district that will never look at local elections the same, neither will their parents. I welcome any corrections and hope to be updating this fluid situation. You know that Ahmanson is the same person who has funded the far religious right policies for many years. He had claimed last year that he switched to the Democratic party because of outrageous taxing by the republicans. I did not believe him then, and I don’t believe him now. If you go back further in any one of these people’s backgrounds you will find a tie of some kind to a religious right organization. Ahmanson, with Darrell Issa and Tom McClintock were behind the committee to recall Grey Davis after the energy crisis in early 2000’s and before Enron was indicted for fraud. These evil people somehow just get my ire stirred up. 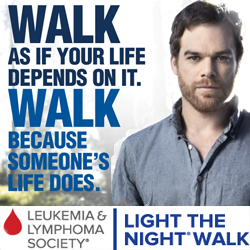 I try to let it go, but I think it is a lot more serious than people know or think. Sue I would love any link or more info on that. Sorry to ask I don’t want to get you upset. One of the teachers said that they felt so bad about some the comments in the OC Register on line page. I was very happy to inform that although some of those are for real don’t believe it all. Then I sent her links on how people can get paid for posting on the internet and told her of some tales of trolls. Later she said, that made her day and she spread the word among her fellow teachers. She understood that those with deep pockets can rent many a troll. I nver get mad at people asking for information. Here are some links on Ahmanson. He is a RR Dominionist, the ones who believe it is their role in life to rule the world. There is other info on him in Republican Gomorrah a very good read. Your public library should have it. Three more Videos . . . .
What an interesting pattern — people in charge of public schools essentially want to shut them down and privatize them. Sounds like the republican party, all right. I wish it was just the Republican Party but it is not. 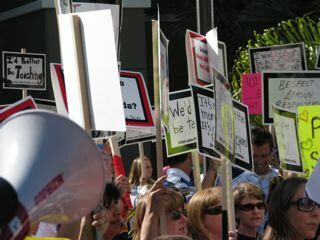 Most of the teachers carrying those signs were republicans. It’s an ultra right wing movement that backs that Education Alliance. This is the area where Orly Tatiz resides. Some of them call themselves Libertarians. They describe the Union as being thugs and bullies of course the OC Register is not doing anything but being a extension of the ultra conservative party. What evil a “Unionized” Teacher! I know those teachers they are not bullies or thugs, but they do read and think. It’s the unions that have been one of the only things protecting the middle class for the past two decades. 30 dead coal miners in West Virginia would be alive today if they had been “Unionized”. but I won’t go there with them. the ‘R” blinders off and think. I am hoping it will help us with our seat in congress 44th district. There is the same cognitive dissonance with law enforcement. The majority are conservative/rep/libertarians but they belong to the police officers union. They have no choice. Good point, Sue. Cops are even more anti-union than most others. Yet they make full use of there union reps when they get into trouble. This is just typical power politics by the so called politically connected elites versus people they see as beneath them and not worthy of communicating with. dildenusa, they depend on people being uninformed, busy, confused, distracted and afraid. 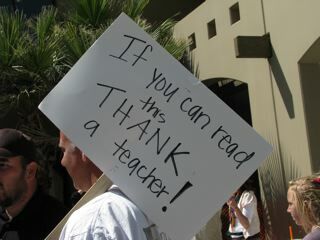 one of the teachers signs read. . . .
Teachers can be a pretty funny bunch. You paint a scary picture, cher. They have put teachers on a constant cycle of end of the year pick slips. Yet never any talk of finding new revenue to support the things that have been working and that the families love. The intention seems so clear. Charters can be a small part of the answer but never at the cost of destroying the foundation of the public system. setting up shop? Which religion do you say yes to and which religion do reject? I can tell you for sure that a good part of the population here would have a total meltdown if a Islamic school were to set up a school. How would you stop that? Sounds like a huge court battle to me. I don’t have a problem with any religions but I know some of my neighbors do. I oppose vouchers for any religious school. I think that crosses the church/state line, because it is using tax dollars to support religion. That aside, I think vouchers for private schools undermine the public system. That said, I am very sympathetic to parents who can’t get responsive school boards. It’s a real dilemma. It seems that the parents who are active are overlooked by the system and the schools base their decisions on apathetic parents-- by which I mean they structure schools around the lowest common denominator. In my day (old fogie again!) schools kicked out kids with behavior problems and there were institutions called “reform schools.” Schools were structured for the average and the good kids. I think it is unfair to teachers and students to have to deal with so many problem kids. Education had better become a priority in this country. And I mean PUBLIC education. Well in my family we had both catholic school and public when I was growing up. They would whack you with a ruler if you got out of line. Great story Patsy. I think we are going to see more and more of these types of protests and strikes. Strikes always cost “management” much more but they don’t care because it’s all about control. Mr Airbrush, Beall, had the Bathrooms locked at the parks near the schools during the time the teachers were picketing. Can we do a GROW for children everywhere? Btw, Steve Jobs, where is my iPad, you promised? Official here, I can’t afford an iPad, my hubby can, but because you thought you were superior, I want one on the house. How is that? Kalima, you would think that anyone could see that is in the best interest of us all to have a vibrant and healthy PUBLIC school system. We need creative thinkers, problem solvers and team players. It’s the public school system that can do the best job there. This school board seems bent on demoralizing our local system so they can push their agenda and narrow the minds of our kids. iPad, hmmm, my daughter tried one out at the apple store and said you can only keep one window open at a time. That would be a bummer for me.